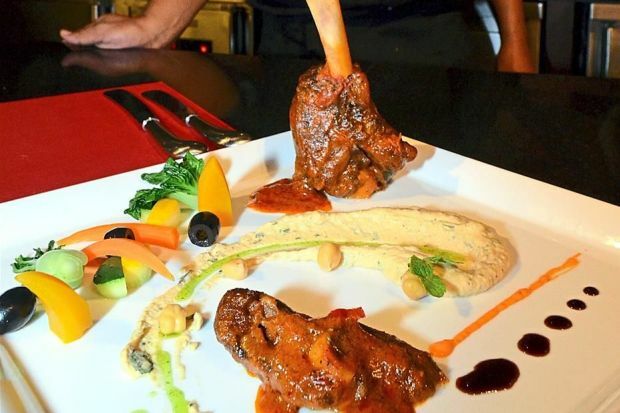 Le Meridien’s executive sous chef Mohd Budiman Bistari never misses a chance to prepare his Braised Bahmia Lamb Shank for his family each year. “This is a two-part dish, as you have to prepare the lamb shanks and marinate them first while the gravy is prepared separately,” said Mohd Budiman. He also cooked a chickpea and eggplant puree, as a healthier starch alternative, with an optional side of organic vegetables. “You can use fillets for the meat portion, but it is better to get the shanks, because the bone marrow and collagen really add flavour to the stock,” said Mohd Budiman. “My family doesn’t mind the variations to the dish as long as the main taste from the tomatoes is there, plus they also enjoy the occasional surprise such as the sweet fruits in the Bahmia gravy,” he added. Lamb Shank: Saute all the vegetables until aroma rises, then add spices. Season to taste, then blend the ingredients into a paste. Marinate the lamb shanks in the paste for five hours, and place in refrigerator. Throw in all the spices and keep stirring until spices are cooked, then add the chilli, coriander, local celery and tomatoes and keep stirring until a paste is formed. Add stock, curry leaf and milk and bring to a boil. Season to taste and reduce the flame. Add the lamb shanks, cover the pot and braise in an oven at 150°C for two hours OR if using a gas stove, let it sit on low flame for between two hours and 30 minutes and three hours, stirring occasionally.